I know I watched this show in the 1980s, but I have to be honest and say that I really don’t remember much about it, other than the fact that they blew up a lot of stuff, Mr. T wore about 6 lbs. of gold chains, and George Peppard’s character uttered that famous tag line in every show. 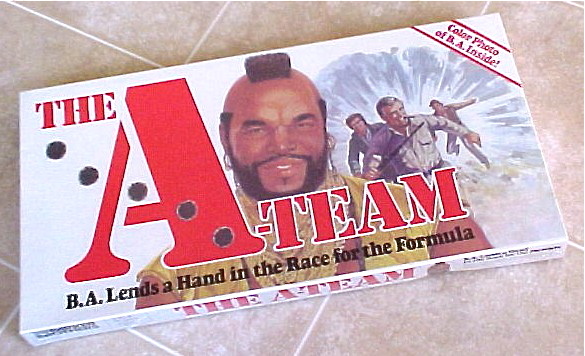 The A-Team game is not necessarily a rare item, but it is rare to find one in this condition, sealed and unopened. What a shame to think that some kid(s) were denied the pseudo-experience of launching motor vehicles and busting up people. Here’s the intro from the TV show featuring real men blowing up real stuff (and lots of it).